For the fifth year running a Green Flag is flying at the splashpark at Christchurch Quay. 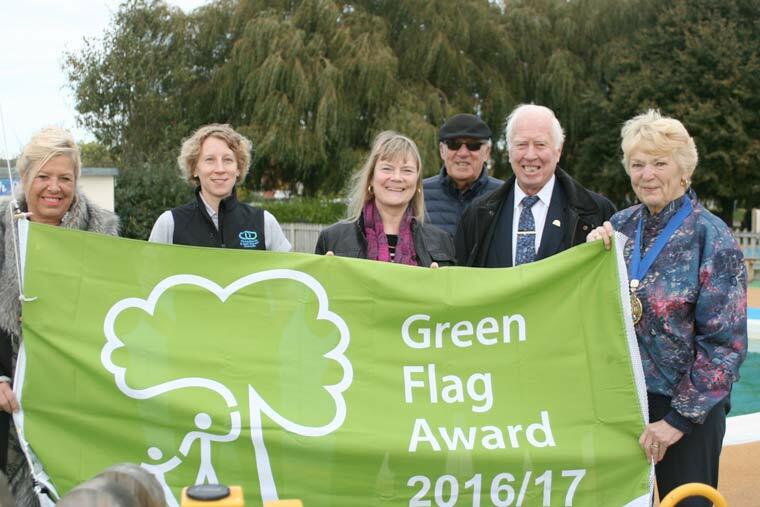 The Green Flag designates Christchurch Quay as having been judged to meet the national quality standard for parks and green spaces. The judges for the Green Flag awards assess the sites against eight strict criteria, including horticultural standards, cleanliness, sustainability and community involvement. The flag was raised by the Mayor Cllr Trish Jamieson along with Cllr Bernie Davis, Portfolio Holder for Safe & Healthy Communities and Cllr Wendy Grace and Cllr Peter Hall, Christchurch Town Centre ward councillors. Community & Recreation Officer Becky Beaumont and Chérie Wheatcroft, artist in residence at Place Mill, were also present to see the flag raised.